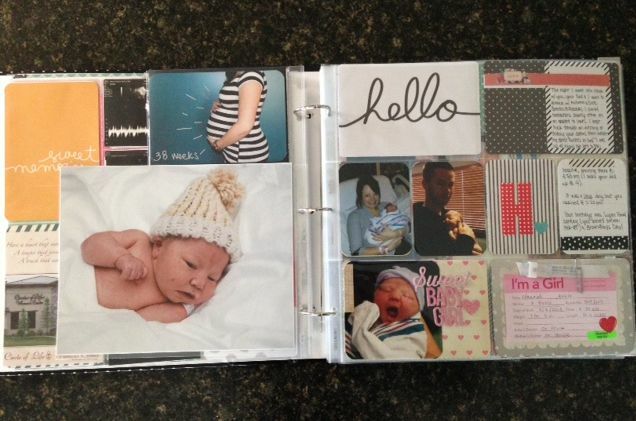 I wanted to share some progress with Hannah’s baby scrapbook. I apologize for the quality of the photos here. I had a really difficult time taking photos of photos, but at least this will give you the gist of the book. When I began this book many months ago I’d decided on the SN@P Simple Stories line. They are pocket pages that are 6×8 and I thought the tiny format would be less daunting, thus easier to keep up. But I actually hated it for this book! I had many things that wouldn’t fit, and with only a couple pictures per page, the book was going to get huge really fast! My sister-in-law was doing Project Life and loved it, so I decide that was a better way to go. 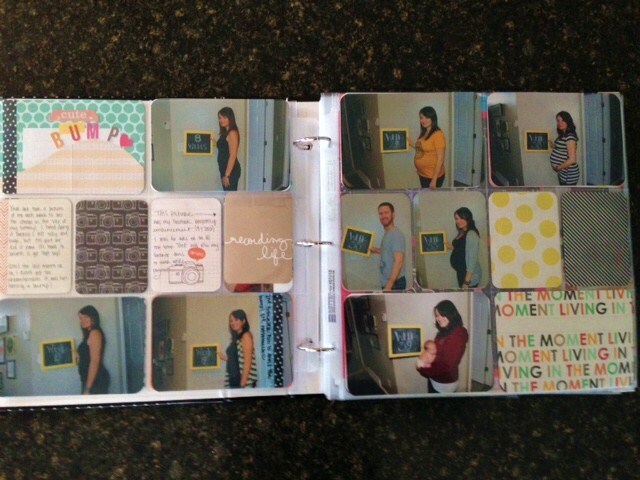 I went with the 12×12 Project Life, incorporating smaller pocket pages between as needed. I love the collage-y effect. Much easier to adapt. 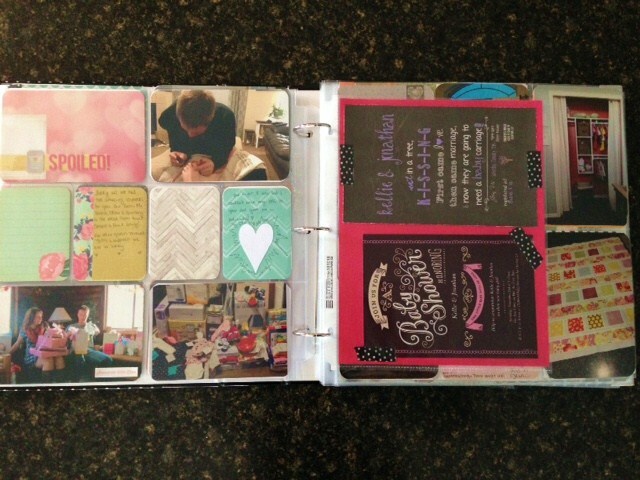 Pocket scrapbooking is great because you don’t have to do full page layouts with tons of embellishments for them to look nice. 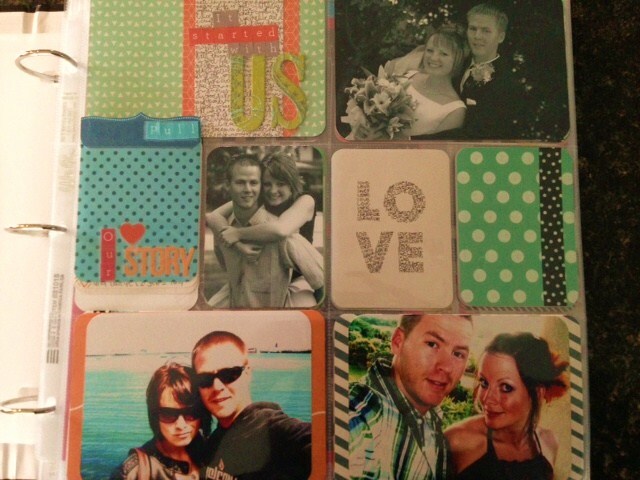 You just put in the photos you want, add some cards, journaling on a few. They can be as simple or as fancy as you like. I didn’t create the pages in any order, but I’m posting on the order they appear in the book so you can see the flow. I began with a page about J and I; though this book is about Hannah I thought she would like to have a little bit of information and a few photos of us before she was born. I added an engagement and wedding photo and a couple random pictures of us that I liked. I created a pull tab for the blue card that extends beyond the pocket and created a flipbook that flips from the top. I wrote down the story of how Jonathan and I met, a bit about our dating years and the years we were married before Hannah came along. I wanted it to be just a quick recap, and something you only read if you wanted to remove it from the book. Next I documented those bump progress pictures J took throughout my pregnancy. I chose I few to show the growth of my belly and wrote some pregnancy anecdotes I didn’t want to forget. I made sure to add the week 35 photos because her dad got a progress shot, too, and I thought it was cute. Next I documented some pregnancy perks like the pedicure J gave me when I couldn’t reach my toes, and our two beautiful showers. I put the invitations in an 8.5×11 pocket. 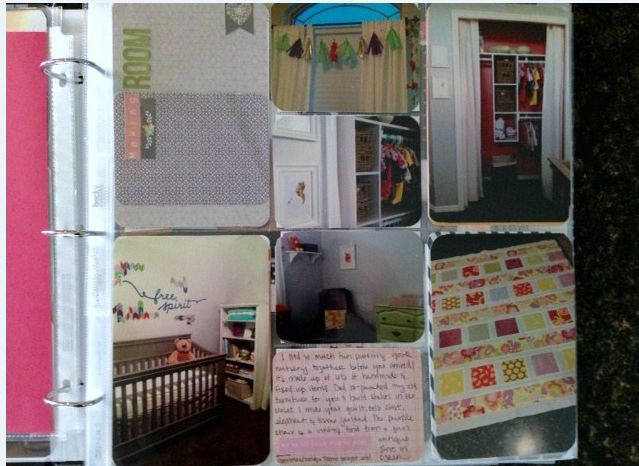 Behind the invitations is a page for Hannah’s nursery. I had a lot of fun putting it together, and wanted to tell her all about all the items that were mine as a kid, given to us as gifts for her, or that her dad or I made for her! The page needs a little work still. 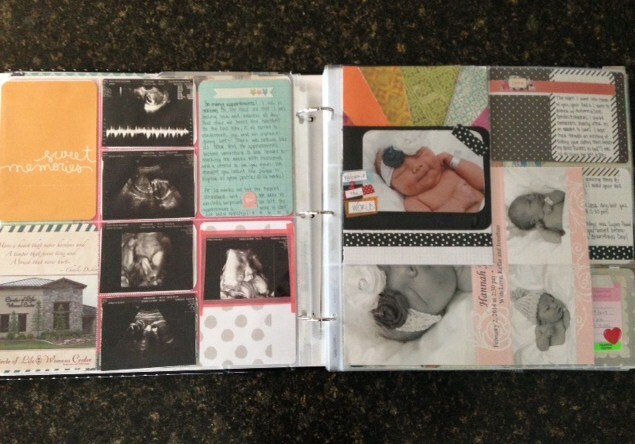 I saved all Hannah’s ultrasound photos and put them into pockets, with a picture of the Women’s Center I went to for all my prenatal appointments. I added some journaling about the appointments and our doctor. 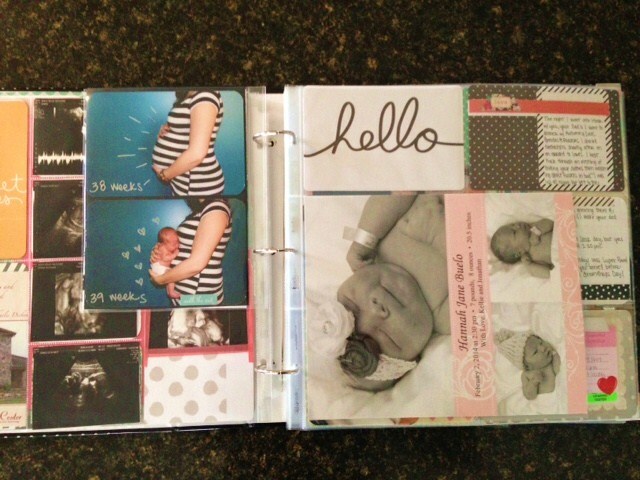 Behind the smaller pocket above is a page I did for the baby belly before and after holding Hannah. I completely stole the idea from someone on Pinterest who did this for a baby announcement. I just thought it was really cute and wanted it for her scrapbook. On the right there’s an 8.5×11 of her birth announcement. The photo package we ordered from the hospital photographer included this. Behind her announcement is another photo the hospital photographer did. The righthand page is Hannah’s official arrival page. I have her first photos, her hospital stats, hospital bracelet, etc. Next is another spread of hospital photos and her footprints. 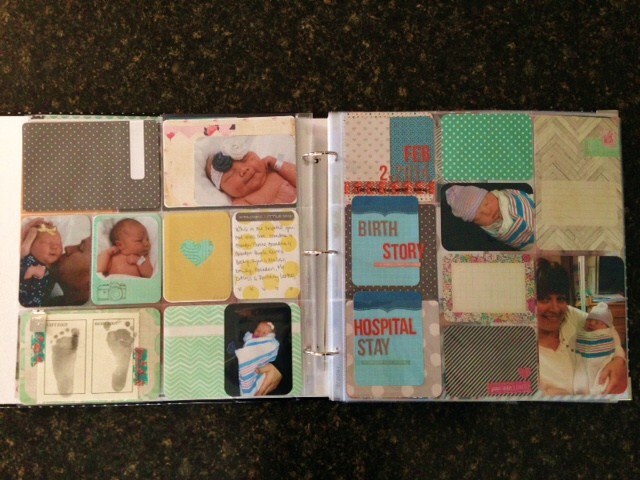 It’s hard to tell but the section with “Birth Story” and “Hospital Stay” is a narrow pocket page. 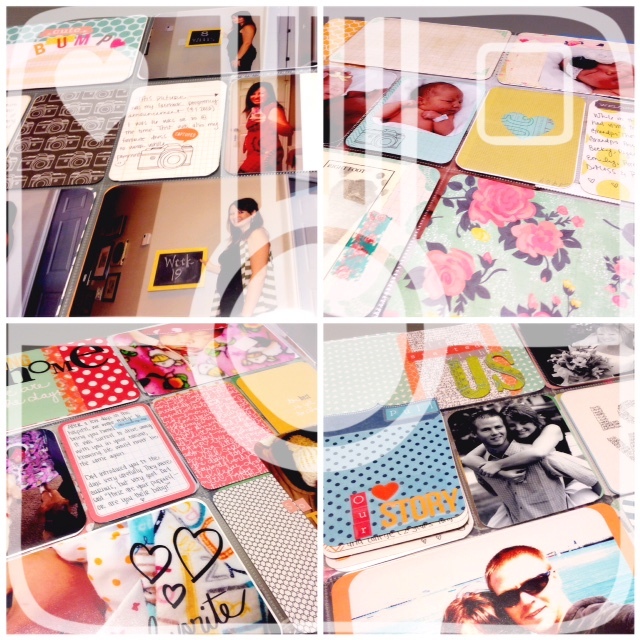 Those cards are more hidden journaling – behind them will have some memories her Dad and I have. I wanted to include some things from her dad’s perspective in the book. I know she will love that when she gets older. I have more hospital photos I want to put on another spread, but need to get more printed. I want to include the shots of her family members meeting her, but I need to track them down from people.